Super League Players pictured at Milebush Park at Mayo League 2016 season launch. Front: Alan Dempsey (Conn Rangers); Gerard O'Boyle (Castlebar Celtic); Pat Fitzgerald, (Westport United); David Grant (Claremorris); Dylan McKee, (Ballina Town); and Niall Tuffy (Ballyheane). Back: Anthony Killeen (Ballyglass); Chris Rowland (Glenhest Rovers), Brian Ralph (Manulla), and Kyle O'Reilly, Iorras Aonthaithe. Photo: Michael Donnelly. 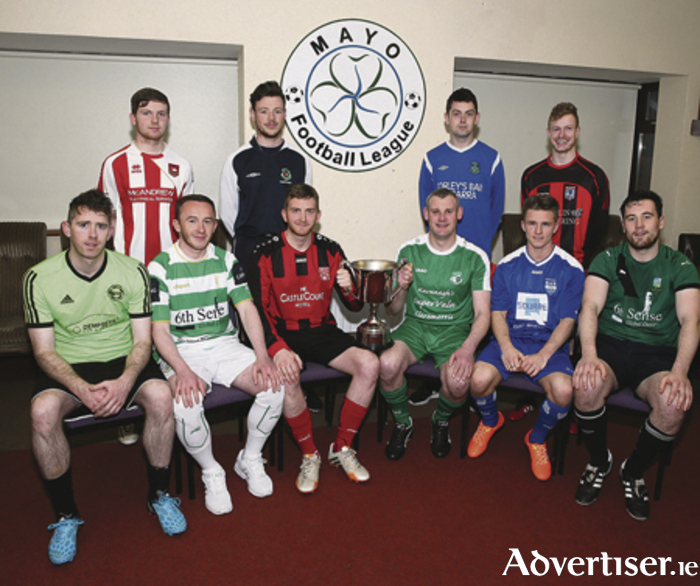 The Mayo Super League kicks off on Saturday evening when Ballyglass and Manulla clash in a tasty derby encounter and Iorras Aointaithe host Castlebar Celtic in Carnenash. On Sunday Ballyheane will welcome Conn Rangers to Quigley Park, while Super League new boys Glenhest Rovers have a tough welcome to the top tier when they travel to the Sportspark to take on defending champions Westport United. The meeting of Ballina Town and Claremorris has been put off to a future date, due to Michael McNicholas' side's Connacht Junior Cup quarter final meeting with Galway Bohs in Galway. The meeting of Ballyglass and Manulla on Saturday evening should be a great encounter to kick start the season. Last time out Ballyglass got off to a brilliant start, mixing it with the best that the rest could offer until they fell away badly in the second half of the season and finished up in seventh place in the table. Manulla in contrast had a sluggish start to they season, but finished off with a great run in the FAI Junior Cup along with finishing fourth in the table and picking up some silverware in the domestic cup competitions. If Manualla can get off to a decent start they could be there or thereabouts at the end of what looks like a very open race for the title. Castlebar Celtic finished up in third place last year after getting off to a woeful start and saw management change on a few occasions during the year, before Ciaran Kilkelly took over on a permanent basis at the tail end of the season. Celtic are traditionally one of the big guns in the division and if they can get things moving from early on they will fancy their chances of taking back the title. Their meeting with Iorras Aontaithe will not be an easy opening encounter, with Martin McIntyre's side capable of putting it up to the best in the division. The north Mayo men will be looking for an improvment on last year's sixth place finish and they are capable of that. Conn Rangers pulled themselves together before the midway point of last season and strung together some very impressive results to pull themselves away from what looked like a relegation battle over the final few months of the season. Manager Joe Faughan will be hoping that they get off to a much better start this season, and if Johnny Cocozza can find the back of the net with regularity they will have a good chance of pushing up the table. On Sunday they head to Ballyheane for their opening game and the Quigley Park outfit is one of the hardest teams in the league to break, if Ballyhane start scoring more goals they could be mixing it with the big boys around the top half of the table. The defending champions know that everyone has them in their sights at this stage of the season and Westport United will be keen to get off to a winning start this weekend. They will be everyone's favourites to pick up the points against league new boys Glenhest Rovers on Sunday afternoon. But George Heneghan's outfit won the Premier A title last year and are a very good oufit and will not fear taking on the standard bearers of the league. Westport picked up where they left off last season when they claimed the Charity Shield last Sunday with a 3-1 win over Manulla, and having been in Connacht Cup action as recently as a few weeks ago they are in top shape ahead of the new season. If John Brennan's men get off to a winning run, they will be confident of being able to go the whole way again this season.